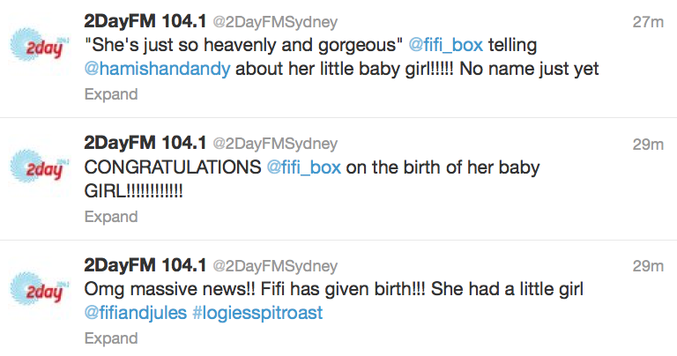 FIFI Box has given birth to a girl according to an announcement on Twitter by radio station 2Day FM. "Omg massive news!! Fifi has given birth!!! 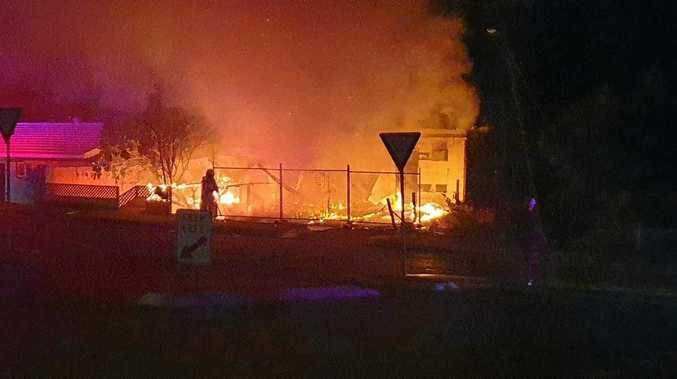 She had a little girl," the station tweeted. Another tweet from the same account quoted Ms Box telling radio personalities Hamish and Andy that her baby was "just so heavenly and gorgeous". The Austereo radio host was interviewed on Hamish Blake and Andy Lee's annual Logies show this afternoon confirming she had the baby today at 2.30pm. "I've had a baby," she told Hamish Blake, Andy Lee and Jules Lund live on air. "She came into the world at 2.30 this afternoon. What's happened is, and you guys will find this hard to believe because you know me so well.. I've sort of been caught off guard and I don't have the name ready." Some of the tweets from the @2DayFMSydney Twitter account.